Robin Kiely, Ryanair, and Donal Healy, Ireland West Airport present Irene Brady with her prize after being named the eight millionth Ryanair passenger at Ireland West Airport. There was celebration at Ireland West Airport last weekend when Ryanair welcomed its eight millionth passenger on flights to/from the airport. Irene Brady from Ballaghaderreen, Co. Roscommon, who was travelling to Liverpool was the lucky eight millionth Ryanair passenger and to mark the occasion was presented with a pair of return flights to Ryanair’s newest destination, Cologne, from Ireland West Airport. Since Ryanair’s first flight from the airport departed to London Luton in December 1986 they have continued to grow their route network from the airport and today also launched their summer 2019 schedule which will offer customers in the West and North West a choice of 13 routes to the UK and Europe, delivering over 600,000 passengers with 46 flights weekly. 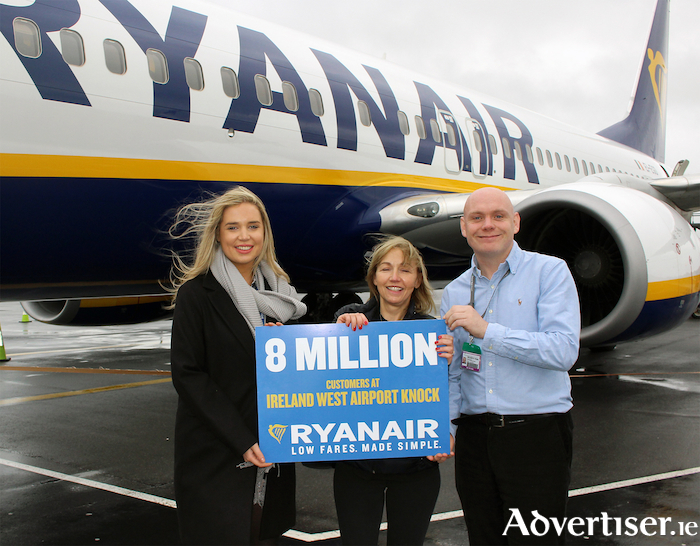 To celebrate the launch of its Ireland West Airport Summer 2019 schedule and their 8 millionth customer, Ryanair launched a seat sale with fares from Ireland West Airport on sale from just €12.99. Robin Kiely, Ryanair said they are pleased to launch their 2019 summer schedule from Ireland West Airport with 13 routes, including a new route to Cologne. “Ryanair is also delighted to celebrate its eight millionth customer since it started operating from the West of Ireland airport in 1986. “Over the last 32 years Ryanair has seen a huge demand for its routes at Ireland West Airport as customers in the West of Ireland snap up Ryanair’s lowest fares to top destinations including Bristol, East Midlands, Liverpool and London Stansted as well as to a host of European destinations in Spain, Portugal, Italy and now Germany”. Joe Gilmore, Managing Director, Ireland West Airport added he was delighted to reach another landmark in the airport’s history and growth with Ryanair in welcoming their eight millionth passenger to use the airport. “I would like to acknowledge the loyalty and commitment that Ryanair has shown to the airport and the West of Ireland over the last 32 years providing vitally important international access to the UK and Europe and in particular their continued support for inbound tourism with their popular mainland European services from Milan and Barcelona. “We are delighted also to welcome a new service from Cologne which starts in June 2019 as part of our biggest ever summer 2019 schedule with Ryanair which will see flights to 13 destinations across the UK and Europe,” he concluded. Ryanair Economy of Europe Aviation European Low Fares Airline Association Galway Airport Ireland United Kingdom Europe route network Spain Germany Liverpool Italy Milan Portugal Bristol Ireland West Airport Joe Gilmore Ryanair Tourism in the Republic of Ireland Barcelona managing director , Ireland West Airport East Midlands Cologne London Stansted Ireland West Airport Robin Kiely Ryan Airlines Ireland airport Irene Brady Warsaw Modlin Airport Ballaghaderreen Co.